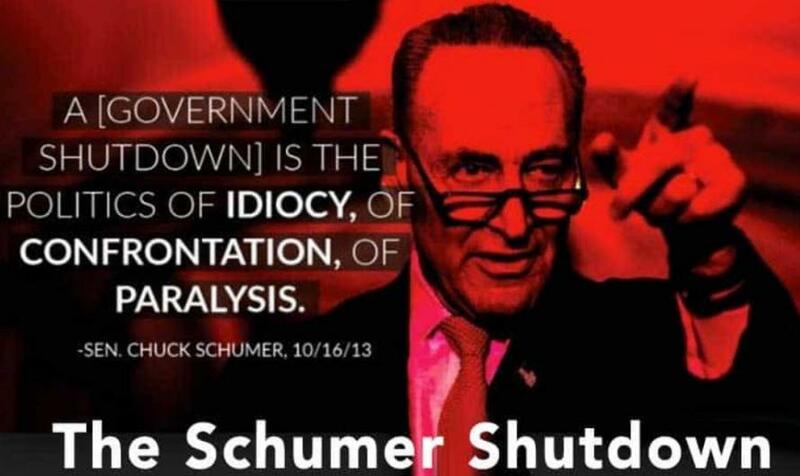 Desperate proponent of the #TrumpShutdown hashtag, Senate Democratic Leader Chuck Schumer is coming under fire from his own party in the aftermath of a fight that shut down the government for three days and left Democrats with nothing to show for it. As The Hill reports, liberal groups were enraged by that decision, arguing Schumer didn’t get enough to back down. “We went in with a very weak set of cards, with  people up for re-election,” said one Democratic senator, one of several lawmakers who requested anonymity to assess Schumer’s performance frankly. Republicans reveled in what they saw as a definite political win. Sen. Shelley Moore Capito (R-W.Va.), a moderate, called it a “no-win” situation for the other side. Several Senate Democrats felt the same way, pronouncing themselves disappointed with the deal Schumer accepted to end the shutdown. “It’s a great disappointment to me and it’s a great disappointment to the more than 300,000 DACA young people in the state of California,” said Sen. Dianne Feinstein (D-Calif.). “The strategy was to keep it fixed to a must-pass vehicle because there was great worry that the House was not going to pass it,” she said of any immigration legislation that might pass the Senate. “I’m just very disappointed,” she said. House Democratic Leader Nancy Pelosi (Calif.) who had been in lockstep with Schumer throughout the shutdown, panned the deal. “I don’t see that there’s any reason — I’m speaking personally and hearing from my members — to support what was put forth,” she told reporters. A fourth Democratic senator, who requested anonymity, said his colleagues didn’t want to prolong the standoff because they saw it as getting worse and worse. “There was inexorable trajectory toward, ‘Now my anxiety is officially high, it’s a week later and what are we doing here?’” the lawmaker said. Florida Rep. Debbie Wasserman Schultz who went on CNN Monday afternoon to try to spin the Democrats' loss over the government shutdown. Daily Caller's Benny Johnson reports that when Schultz was asked point-blank what the point of the government shutdown was her response left Baldwin’s jaw on the floor. “What one thing did [Schumer] get, you know, from Republicans, to justify shutting down the government in the first place?” Baldwin asked.